Photo by Melinda Sue Gordon ©2015 Paramount Pictures. All Rights Reserved. Jai Courtney. Photo by Melinda Sue Gordon ©2015 Paramount Pictures. All Rights Reserved. 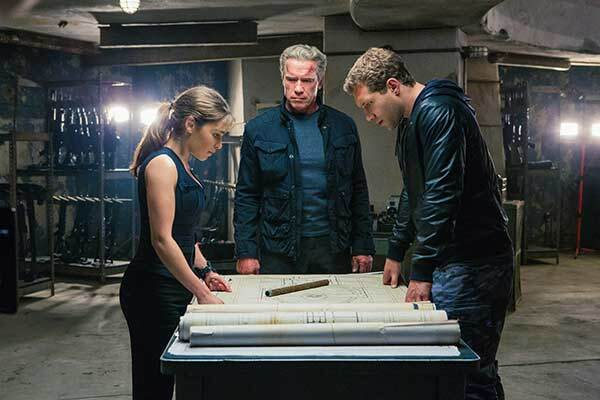 Veterans of blockbuster action films, Production Designer Neil Spisak and Set Decorator Jay Hart SDSA took on the monumental task of creating the huge sets for the new venture into the TERMINATOR universe: TERMINATOR: GENISYS. SET DECOR covered Hart’s work on TERMINATOR: RISE OF THE MACHINES in one of the magazine’s earliest issues. We have subsequently covered his work on several major motion pictures, including 3:10 TO YUMA, and KNIGHT AND DAY. 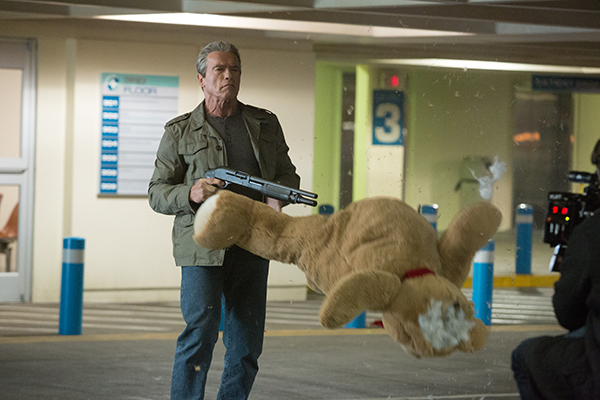 Now, over a decade later, he chats with us about the making of this newest projection of the Terminator mythology! Set Decorator Jay Hart SDSA: Yes, if you try to figure out the timeline of all the films as we did, it does not come together as a logical timeline, thus the “reset”. So, you just have to take this film as it is and embrace the movements through time from 1984, 2013, 2017, and 2029. 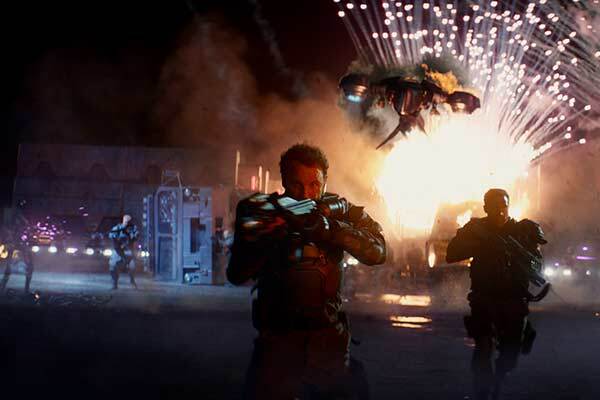 SET DECOR: The film opens with a destroyed Los Angeles 2029 and a final massive offensive of Human Resistance against Skynet, the artificial intelligence system trying to eliminate the human race. Tell us about dressing an apocalyptic battlefield! Hart: The apocalyptic scenes in the film where grounded in practical sets. The VFX extensions were city backgrounds and skylines. 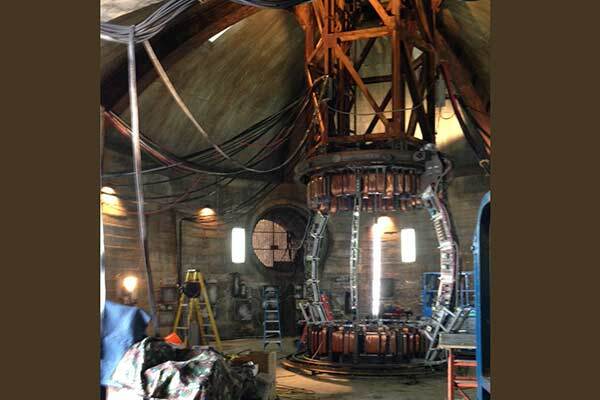 The largest of the apocalyptic sets was the machine encampment that had the hidden time machine under it. The backstory here was that in 2017, when the machines took over and launched nuclear missiles, one of the areas hit was Los Angeles. 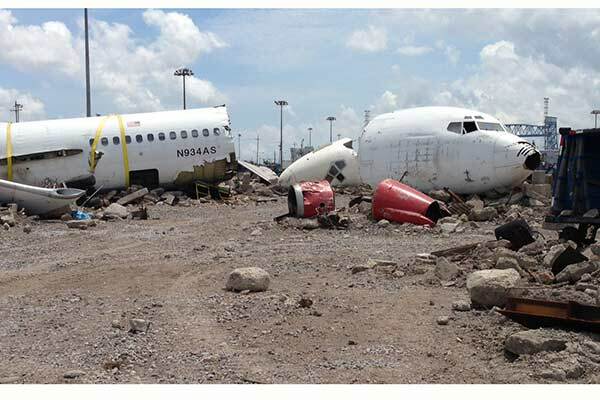 So our set contained parts of aircraft and detritus from the ruins of the sprawling airport. We rented two 747s that were in parts and pieces, and we craned-in the fuselages. After establishing those larger pieces, we added the bits from the airport and then filled in with rubble…things like concrete, streetlights, airport service vehicles, trashed cars, etc. This set was shot in an empty parking lot along the river in New Orleans. It was 4 football fields long. We had a set dec team dedicated to that set for 2 months. I have to give a “hats off” to Ely Vegh, the LA gang boss who gaffed that set. It was truly a massive undertaking. 3-story foam walls that could be moved around to make the set seem larger. The actual laser wall pens were all VFX. Did this “re-purposing” by the characters apply to the set dressing for 2029 as well? Hart: Yes, we shopped for derelict items that had a 2017 feel, as that was when the apocalypse had occurred, and made sure that those items could have still been around in 2029. Very evident in the tunnel/culvert scene where young Kyle is rescued by John Connor. We gave it the backstory that someone had been living in there…a crude bed, a crib, rocking horse, etc. Hart: The alley was a hard set to do. It was a real alley in downtown New Orleans and was very rank when we first got there, and had to be sterilized so we could work there. We modified the alley quite a bit, closing existing doors and building additional iron fire escapes, all to fit the story and to definitely try to match the alley from the first film. The niche for the homeless guy was built and we were very involved in the lighting of this, as it was one of the few moments in the film when we were shooting tungsten. We tried hard to capture 1984…we even had newspapers made for the blowing debris that headlined 1984. The details of the alley, things like signage and garbage and pipe runs, are as important as the drapery in the White House. SET DECOR: In tying the discount department store to 1984, did you work with Costume Designer Susan Matheson on stocking the clothing racks and mannequins? Was there any other specific dressing to anchor us in 1984 or was it purposely kept non-time-specific? Hart: We did work with Susan on the dressed mannequins as, again, we wanted to be sure of the 1984 vibe. We, however, did everything else from scratch. The space was an abandoned hotel lobby that we added exterior windows to, and we provided all of the interior racks and clothing and lighting. The trick here was to get enough! The volume of clothes needed was massive. It would have been impossible to supply all vintage 1984 clothes, so we did purposely pick ND clothes that would not call attention to themselves. Plus, we had to accommodate all of the crashing and shooting, etc. One of the fun elements of that set was building the photo booth that Kyle hides in. A bit of vintage design is always fun. SET DECOR: The most significant sets for 1984 were the brick tunnels of Sarah Conner’s and the Guardian’s subterranean hideaway. We have several questions! o Loved the hardware details! Tell us, please! o Did you have to provide practical lighting in these sets? o Tell us about decorating spaces like this! o Where was this shot? Hart: This cluster of sets was all one-piece, built in one of the large hangars at NASA in New Orleans. We definitely needed the height of that space for the time machine. The acid tunnels and roundabout were a challenge. 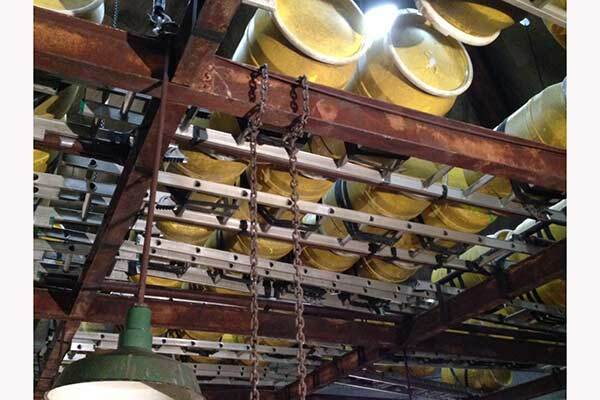 We had to purchase, rig and hang all of the yellow barrels, and then work with Mechanical FX to rig the barrels so the liquid could come out. Our practicals lit the set, again another tungsten moment in the film. We paid a lot of attention to the background hardware in these sets as it would have just been a bunch of brick walls otherwise. 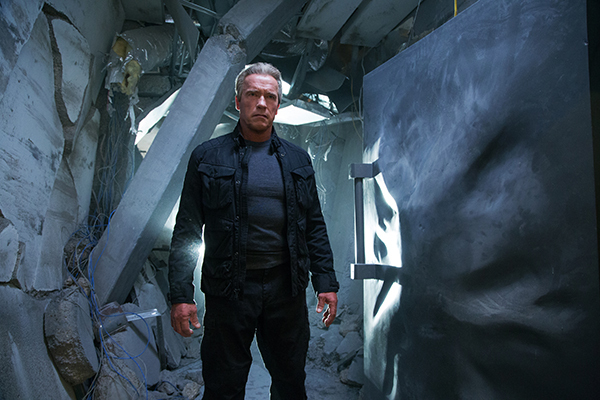 Production Designer Neil Spisak spent a lot of thought on the backstory…an abandoned coal-fired power plant. 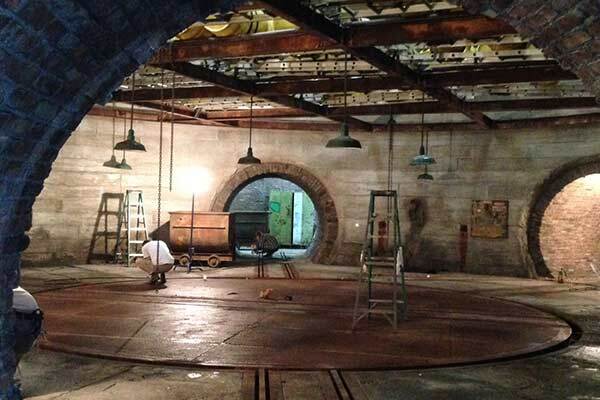 The floors had iron rails for old coal carts, and his work with the scenic painters was awesome. Arnold’s time machine was the highlight of the show for me. We spent a huge amount of time on this unique set element. Phil Edgerly, who is an at-large shopper, graphics guy and jack-of-all-trades, found a warehouse in western Pennsylvania that was being dismantled. He flew there from Washington DC and sent me photos. 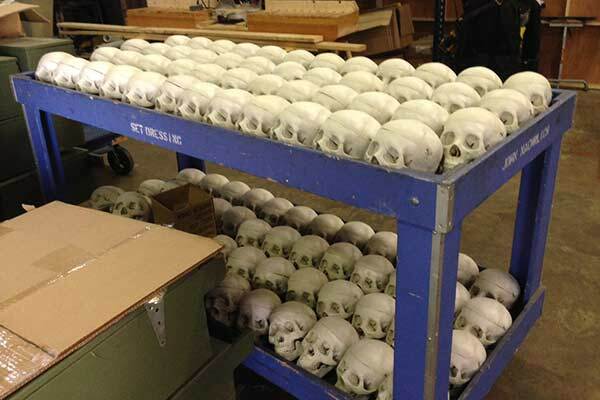 We ended up buying out most of the warehouse and shipping it to New Orleans. They had choice vintage electronics and perfect bunker dressing. So we started the production with a warehouse full of excellent vintage items for those beats in the film that required it. The time machine was layered by Jack Cornelius, another LA gang boss, who specialized for us in doing the futuristic detailing. SET DECOR: We couldn’t leave the 1984 sets without mentioning the Griffith Park Observatory scene, another direct homage to the original film. Hart: Would you believe, we built a replica of the food service area and the rear of Griffith Park Observatory in a parking lot in New Orleans! And, of course, we went to a lot of trouble to match the shots from the first film. Hart: The majority of the Bay Bridge scene was shot on a closed roadway in NOLA. However, it required a lot of VFX to make it look like San Francisco. The Golden Gate Bridge sequences were another story entirely. We built/re-created 100 feet of the Golden Gate Bridge...and Set Dec built from scratch those iconic light fixtures that line the bridge. 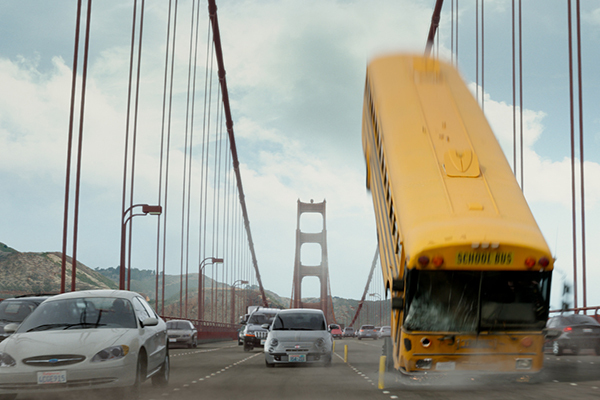 The bus-flip on the bridge was done as a practical, so kudos to the Special FX team who made that work. It was pretty amazing to watch. Hart: Those were built sets in an empty Home Depot in NEW ORLEANS. We built 2 interrogation rooms with 2-way mirrors that could be taken out and replaced with clear glass for ease of shooting—2 of these so they could be filmed simultaneously as there was a lot of coverage involved with this. 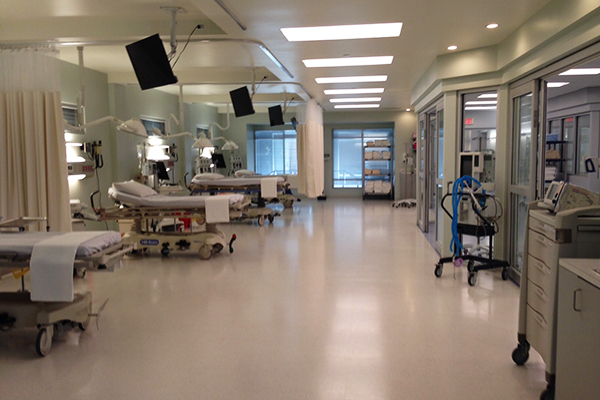 SET DECOR: It was slick, and the Hospital for 2017 was even more so! Hart: To my eye, this was one of the most well done sets in the film. Hospitals and police stations can become redundant and boring. We tried hard to make this one contemporary and slick and attractive. Phil Edgerly found me some really great vintage images of San Francisco that we had enlarged and tinted and used as the hallway art in the hospital. SET DECOR: A Marin Headlands bunker was the hideout where the Guardian had been preparing, from 1984 until 2017, for the arrival of Sarah and Kyle. What did you incorporate to delineate the difference between this and the 1984 hideout? Hart: The start of the sequence was shot at the actual Marin Headlands above the Golden Gate Bridge. There are military installations that are still there from World War II. So we shot the exteriors there and then cut to the interiors built in New Orleans. Neil designed a beautiful underground bunker. Again, underground bunkers can become redundant…all boardform concrete and rust. This one was painted a much lighter color and had really interesting architecture. 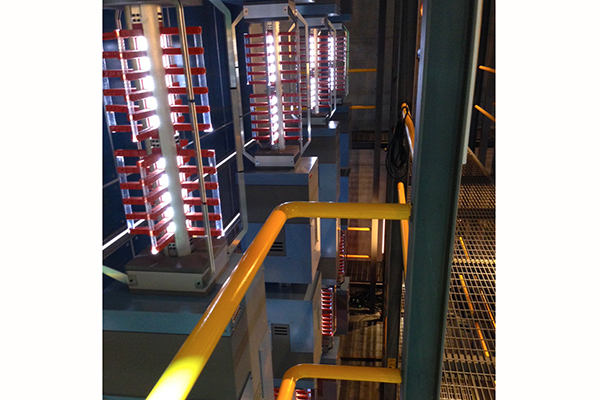 The lighting was all via skylights and practicals that we attached to the ceiling and to the many, many gun racks. 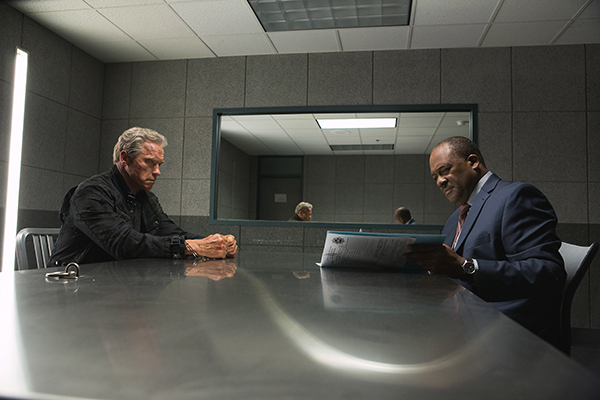 Hart: Cyberdyne was shot at the Oracle Corporation headquarters. The lobby itself was all shades of natural gray, stone and black leather. I wanted to counterpoint that with hits of white. We used Artemide floor lamps in white and accented with an abundance of white orchids. The GENISYS mainframe was the most difficult build for us. All of the two-story box servers were built by our in-house set dec construction department, detailed by Jack Cornelius and then lighted with very complicated LED rigs by Phil Abeyta, our department lighting guru. Lead John Naehrlich came up with a special dolly just to get them around and into place. The build was all I-beam metal and was a truly complicated piece of scenery. It was all worth it in the end, as it gave them a kind of jungle gym to shoot in. 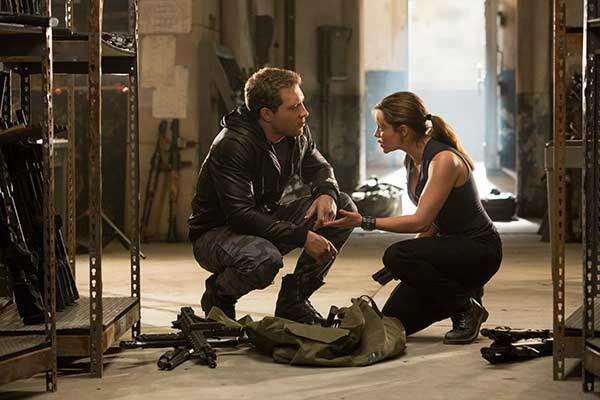 SET DECOR: And just the opposite was Kyle Reese’s bucolic childhood farmhouse home. Was this shot in California? Hart: The opening sequence of the film was shot just outside of Petaluma where the rolling hills and water are so lush. We then cut to a farmhouse in the NOLA area that we redid to feel like it was outside of San Francisco: the dining room and one of the bedrooms for the birthday scene, and Kyle’s childhood bedroom. The house was ravaged by Hurricane Katrina and had been ¾ underwater at one point. The owners had done their best to bring it back, but it was a little sad. SET DECOR: This was the first film in the series to be shot digitally, as well as the first to be shot with anamorphic lenses. Did that impact set decoration? Hart: Yes, indeed. 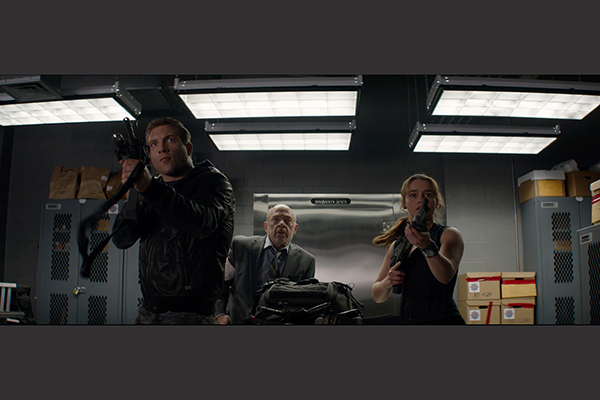 Anamorphic is wider and flatter, and you have to pay attention to the outsides edges of the sets, as they will be seen. Digital is by its nature a little cooler, so we did try to amp up the warm tones a bit, but not all that much. 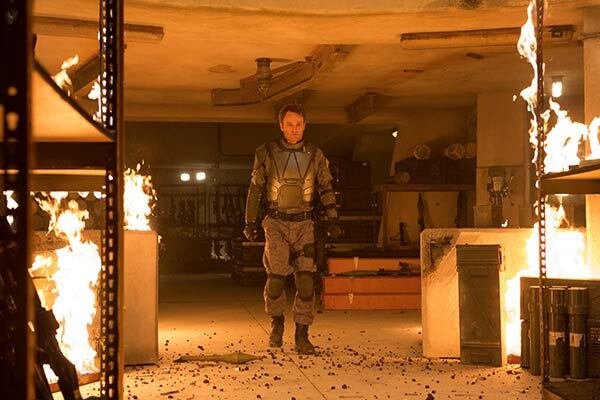 SET DECOR: How much did you work directly with Visual Effects? Did you provide set dressing elements for them to work from? 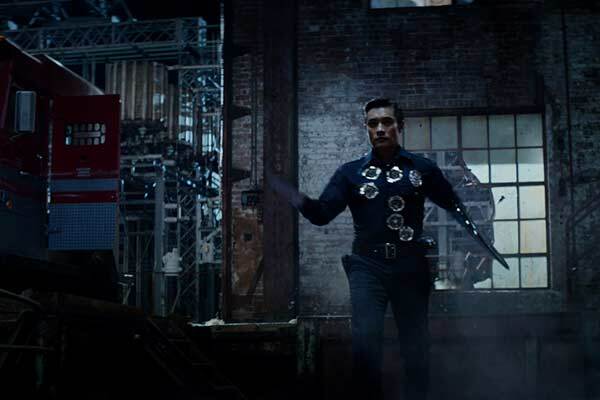 Hart: Neil was more involved in VFX. 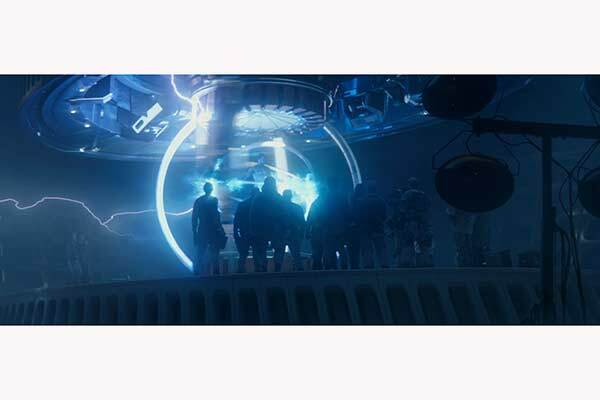 We did supply set dressing for them to use and we built some proxy elements, for instance the large static electric ball that is generated when the Terminators and Kyle time travel. We built a large chroma blue ball as a stand in for that. We were, of course, always discussing where practical elements ended and VFX began. Hart: The scenery was huge, just from a scale point of view. Just damn big. The NASA sound stages are what made shooting in NOLA work. SET DECOR: We remember visiting the huge Daily Planet set you and Neil did at Sony for SPIDER-MAN 2, featured in another issue of SET DECOR. Hart: Reuniting with Neil was a pleasure. I knew going into it what we were capable of together. He is a gifted designer and very collaborative. We spent huge amounts of time rolling through the sets together and collaborating on all aspects. He has a very witty and edgy sense of humor, which made the process not only rewarding but fun. Hart: I, like so many others, have become a migrant film worker. I have done one movie in Los Angeles in 8 years, so the majority of my life at this point is on the road. It is a joy and disappointment at the same time. I am truly grateful to be able to go to exotic and some not-so-exotic locations and immerse myself in the film world there, as well as the local culture, but I do occasionally long to just be home for a while. Gratitude in all things!!!! SET DECOR: What was the biggest challenge on this film? SET DECOR: Could you share some of your resources that were particularly helpful/useful for this film? Or throughout your film career? Alpha Medical is a rock star. They always come through for me. Jennifer at Film Art LA is a gem and an ally in all things art! Plus she is just a great person. Robert Greenfield, for what he has done with Warner Bros. Props. What a transformation and an invaluable resource. Alan Songer at Omega Cinema Props is a true helpmate. He has fabricated one-of-a-kind items for me and they are always flawless. And last but certainly not least, my crew—workmates, friends, allies—they lift me up…Mick Cummings the best shopper/buyer…John Naehrlich the best leadman! To them, and everyone else who has struggled in the trenches with me, I am eternally grateful.